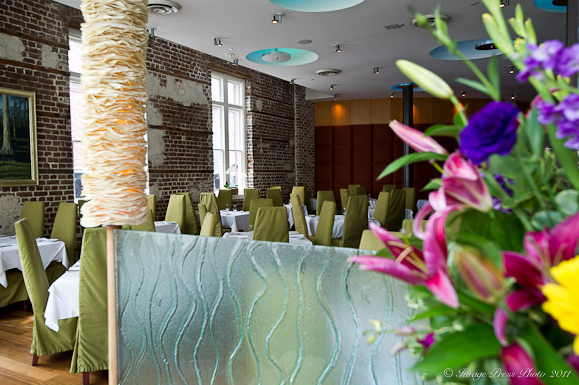 Charleston, South Carolina is one of our favorite culinary destinations and has been for many years. We love the feel of the city and the fact that there are great restaurants on nearly every corner. Cypress is one of the restaurants that we have enjoyed over the years (on several occasions), so we were excited to be able to sit down and meet with Executive Chef Craig Deihl on our latest visit to the city, just a few weeks ago. 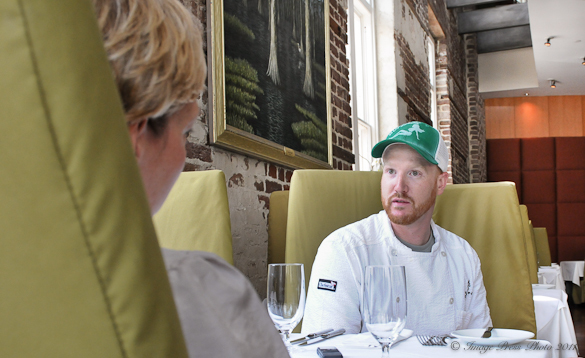 Chef Deihl was one of six finalists in this year’s James Beard Foundation Best Chef Awards for the Southeast. In fact, he was just a week away from heading to New York City for the festivities surrounding the announcement of the winners when we met with him. He was also named Chef of the Year by the Greater Charleston American Culinary Federation Chapter in 2010 and was recently featured on an episode of Unique Eats for several of his small plates and bar menu items. Deihl, age 32 and originally from Danville, Pennsylvania, is a graduate of Johnson and Wales University. 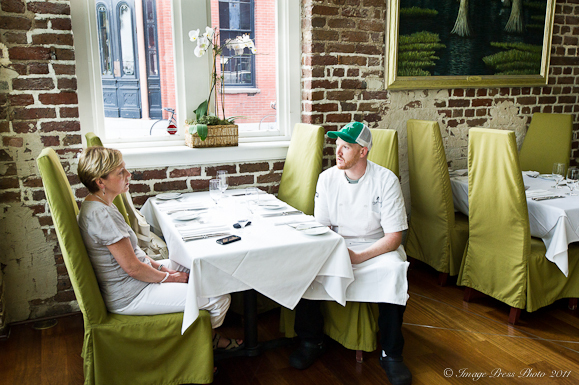 Deihl began training at Magnolias in Charleston, working in that kitchen for almost five years before he was asked to help open Cypress in 2001. He became Executive Chef after only six months. Deihl said that Cypress is much like him in that the exterior of the building is old-fashioned, yet the interior is very modern. 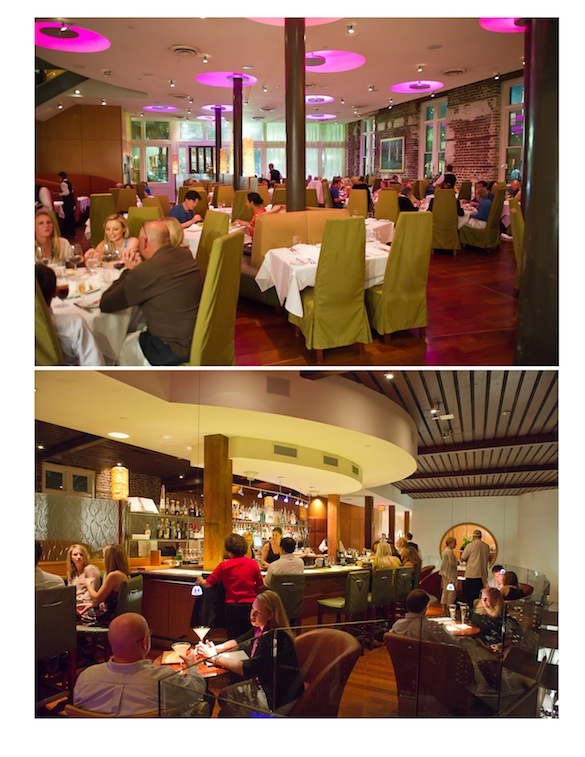 This quite large and stunning restaurant (it seats 350 people) is very different in style from the other restaurants in Charleston. Covering two stories with a bar area upstairs that overlooks the large open kitchen, you get a sense that you are in a major metropolitan area. 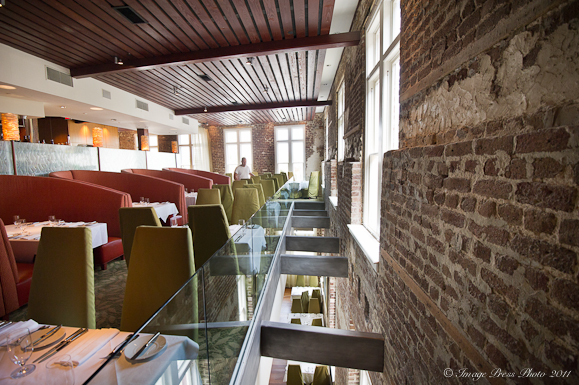 The wine cellar also covers an entire wall of the restaurant and is two stories high. 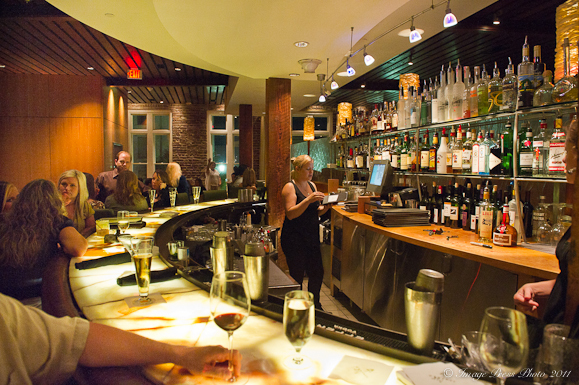 Dine at the bar for a more casual experience. This chef has really gone under the radar over the last ten years, which was very surprising to us. He said that it was his Charcuterie and Artisan Meat Share program that has brought him into the spotlight. Deihl, who is self-taught in this area, began breaking down animals and making his own cured hams and sausages about 4 1/2 years ago. He also dry ages his own beef. 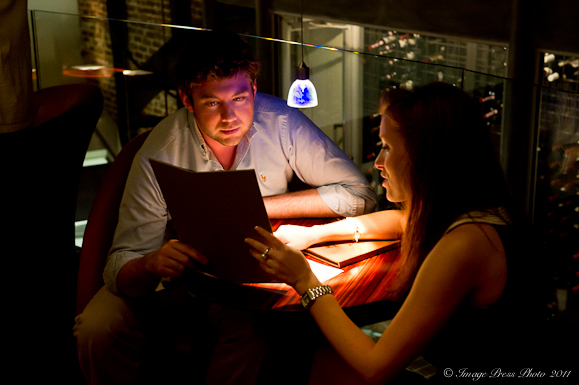 The setting is very romantic in the dining room or the bar at Cypress. yum, love that recipe and am definitely making it for the boyfriend when I see him! thanks for sharing, Cypress looks like a great place! What a great post… I was just chatting with a friend about purchasing grass-fed beef and we were talking about the fat issue (funny, seeing that i don’t eat meat… but, believe me, i get the appeal). Interesting to read the Chef’s take here. this very soon. Beautiful dish! Thanks for another fantastic food blog! What a beautiful restaurant. Tuna is my hubby’s favorite too (like Jane), I’ll have to try this. That list of ingredients is a bit intimidating though! Yes, it is a gorgeous restaurant and the food is just as pretty. If you will take the recipe in steps and prepare each sauce separately and set them aside, you will find that it is a very manageable dish. It just takes a bit of organization, but it well worth the effort. Just so you know, the wasabi powder isn’t in the tuna ingredient list so I don’t know how much I’d need to add to the pineapple juice. Hi, thanks for the catch! Too much late night typing. 🙂 Yes, there are 4 tablespoons wasbai powder, which I have added to the recipe. It was almost a whole small can of Eden’s Wasabi Powder. i hope you try the recipe. It is fabulous! Wow. I really loved this interview. As one who “almost” went to culinary school, and oftentimes wonder if I should have… I’m reading this now and thinking to myself, “I could never do what Chef Craig Deihl has done. That’s a MIGHTY recipe list; but I think I’ll attempt someday. We visited Cypress on our recent trip to Charleston at a suggestion of my daughters’ boyfriend that loves “good food experiences” as much as we do. We ordered the Crisp Wasabi Tuna and I cannot find the words to describe how delicious this was!! Everything we ordered was fabulous and we actually ordered so much, we had leftovers for the next day; which were as delicious as the first time we ate them. I am SO EXCITED to find the recipe for the Tuna on line….I can hardly wait to try making it myself !! What a great interview, Gwen. I keep hearing that I need to go to Charleston for the food! That tuna looks to die for! Your interviews are fascinating! Chef Deihl’s actions and sentiments resonate with me – from the charcuterie program he has instituted to the lost art of raising grass fed beef and that amazing tuna dish! I’ve simply got to get to Charleston! I’m forwarding links to your blog to my son-in-law, formerly of Aujourd’hui at the Four Seasons Boston, who is opening his first restaurant (Catalyst) in August. Had the crispy tuna last week at Cypress — fabulous! This recipe is not exactly the same but close enough. I liked the presentation of the tuna — two pieces about two inches thick wrapped in phyllo. Can’t figure out how they cooked the phyllo without cooking the tuna! We live on the Spacecoast of Florida with some good restaurants but think we will spend time on the road going to Charleston to eat our way around the city. The other two hits of the evening at Cypress were the sourdough bread and our very personable waitress, Shelley.